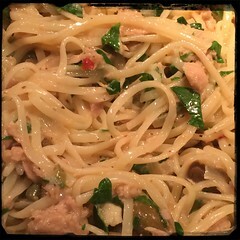 Here’s an offshoot of out Linguini with Tuna and Black Olives dish IThe prep is rather quick, so it’s a great choice for a pasta dinner during the work week. 3. Sauté the garlic until it begins to brown slightly. 8. Add one spoonful of ‘pasta’ water, a dsah of salt and some pepper. 9.before adding the linguine (al dente). 10. Toss in thye fresh chopped flat-leaf parsley before serving.